dichotomously branched ectomycorrhizas of a basidiomycete with a conifer. dichotomous ectomycorrhizas (upper) and mycelial strands (lower) of Amanita muscaria on Pinus strobus. ectomycorrhizas of Laccaria bicolor with Populus tremuloides. transverse section of an ectomycorrhiza of Pseudotsuga menziesii with Rhizopogon colossus showing the fungal mantle (brown in this example). 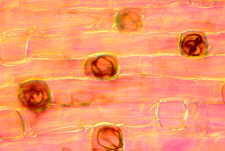 section of outer layers of an ectomycorrhizal root of Pinus strobus, showing some of the mantle and the Hartig net - the latter formed by hyphae of the mycobiont, Pisolithus tinctorius, penetrating between the cortical cells of the root. 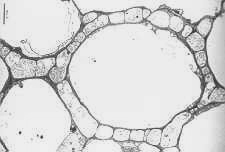 Ectomycorrhizas - a root cell completely surrounded by hyphae of the Hartig net. 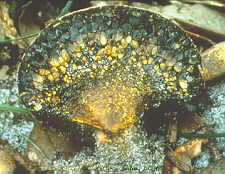 mantle of an ectomycorrhiza of Populus tremuloides in section and Hartig net in surface view - the section was cleared then stained with chlorazol black E. The fungus is stained dark brown. Viewed with interference contrast. (see Fig 52 in Brundrett et al. 1990. Can. J. Bot. 68: 551). 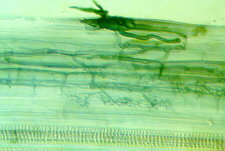 surface view of the uniquely branched and contorted hyphae of the Hartig net filling the space between cells of the root cortex of an ectomycorrhiza. 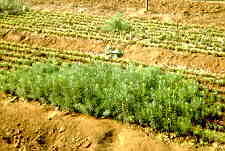 seedlings of Douglas fir with and without ectomycorrhizal partners. 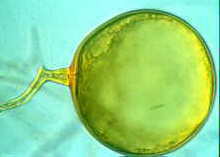 bisected basidioma of Pisolithus tinctorius, an important ectomycorrhizal fungus, showing the gleba divided up into locules, and the yellow pigment in the base. a later stage of colonization. The arbuscules contract and degenerate, and more vesicles develop. a leek root packed with vesicles of its endomycorrhizal fungal partner. these structures in the "roots:" of early land plants fossilized in the Rhynie Chert (350 MYBP) are regarded as vesicles of an early endomycorrhizal fungus. 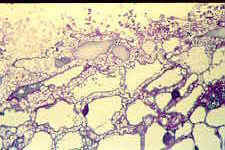 endomycorrhizas - extramatrical spores of Glomus versiforme (M. Brundrett). 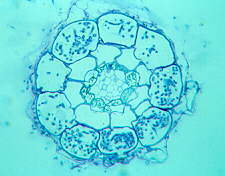 section of a sporocarp of Glomus, an endomycorrhizal fungus. the "big plant - little plant" experiment showing the benefits of the endomycorrhizal symbiosis (plants on the right are not mycorrhizal). 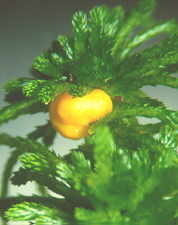 Endogone pisiformis fruiting on Sphagnum in a bog. 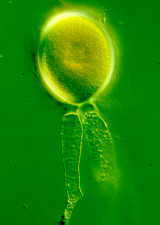 The yellow sporocarp contains a very large number of zygosporangia (below). 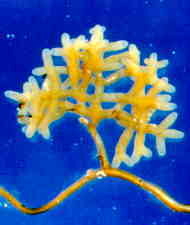 Though formerly recognized as the type genus of endomycorrhizal fungi, Endogone is now known to be ectomycorrhizal. Arbutoid mycorrhizas of Arbutus menziesii with Lactarius deliciosus. Transverse section of arbutoid mycorrhiza of Arbutus menziesii with Lactarius deliciosus. 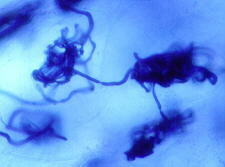 Note mantle, and cortical cells filled with hyphae. 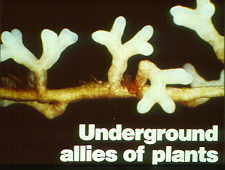 Arbutoid mycorrhiza - high power view of part of section shown above. 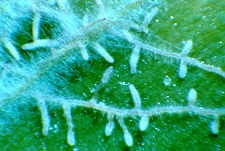 ericoid mycorrhiza of salal, Gaultheria shallon. 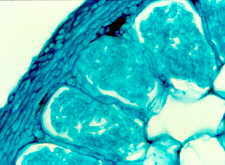 Dark blobs are masses of fungal hyphae in cortical cells of root. 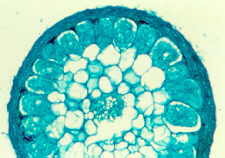 transverse section of ericoid mycorrhiza of salal, Gaultheria shallon. section of part of a monotropoid mycorrhiza of Monotropa uniflora. Note the diagnostic peg-like hypha penetrating a root cell (indicated by arrowhead). root cells of Goodyera oblongifolia containing coils (pelotons) of hyphae (probably of a mycorrhizal Rhizoctonia). 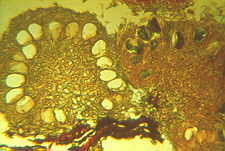 Goodyera cells again: note two distinct constrictions in the fungal hyphae where they penetrate from one cell to the next.